Housing California and its allies changed the course of California’s affordable housing future, passing Props 1 and 2, a combined $6 BILLION in new funding for the development and preservation of affordable and supportive homes. Unofficial results show Prop 1 won with 54% of the vote and Prop 2 passed with 61%. On election day, voters took a stand and expressed their values on their ballots. They resoundingly said it is time to create a more equitable California in which people living on modest wages or fixed incomes and people experiencing homelessness can afford a safe, stable place to live in their communities. The broad coalition was made up of more than 600 organizations, including affordable housing and equity advocates, business and labor leaders, cities and many more committed to helping Californians have safe, affordable homes and end homelessness. The campaign Executive Committee was led by four key organizations: California Housing Consortium, Housing California, Silicon Valley Leadership Group and the State Building and Construction Trades Council of California. A Steering Committee of respected leaders and organizations across many sectors also supported the campaign: Senate Pro Tem Toni Atkins, Sen. Jim Beall, Assembly person. David Chiu, housing advocate Jennifer LeSar, League of California Cities, Dignity Health, Habitat for Humanity California and the Steinberg Institute. The state is expected to issue its first notices of funding availability in spring 2019. 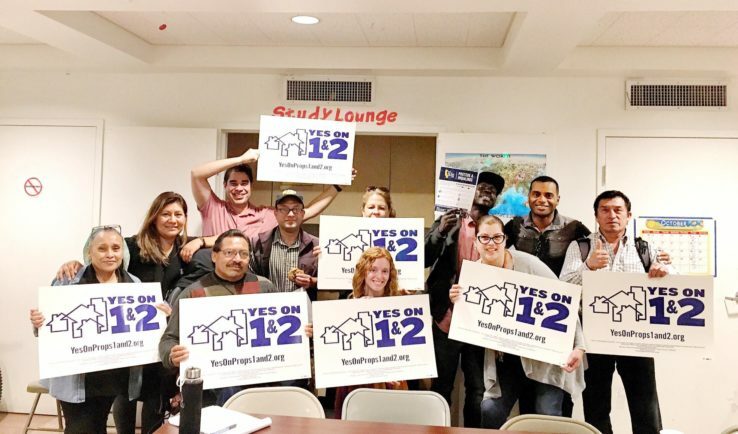 Prop 2 is equally important, providing supportive homes for Californians living with a mental illness struggling to survive on the streets or in shelters without the stability and access to services they need. With $2 billion, Prop 2 will build an additional 20,000 supportive rental homes that provide mental health services to help end homelessness for thousands of people. Homelessness advocates, doctors, mental health professionals, emergency responders, and law enforcement all agree – supportive housing works and we need it if we are to end chronic homelessness in California. It is clear that voters want action to bring more affordable, equitable places to live and to end homelessness in their neighborhoods and communities. This is why Prop 1 and Prop 2 passed. Housing California will work with the new administration and the legislature to continue to work on policies that will help end and prevent homelessness and provide more affordable homes for underserved Californians. Thanks to Nur Kausar, Communication Manager, Housing California for the content of this article.